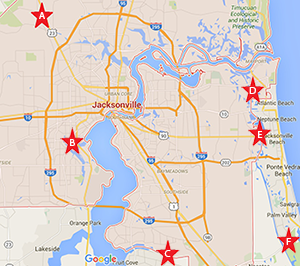 Adventure Kayak Florida offers guided kayak tours at 6 different locations in or near the following communities. Our goal is to connect adults and children to the outdoors and traditional outdoor activities. Our available tours include half and full day tours, family tours, bird watching tours, team building tours, and photography tours. If you need to get away for the weekend or longer, check out our kayak camping tours and extended expeditions. Adventure Kayak Florida offers Kayak Lessons! If you do not see your community listed below, please feel free to contact us or call us at 904-404-6177 to learn about our guided kayak tours and find locations near you.